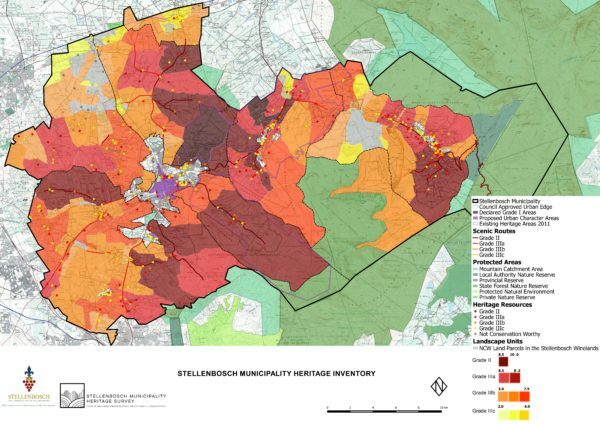 The project ‘Heritage Inventory of, and Management Plan for, the Tangible Heritage Resources in the Stellenbosch Municipality’ has reached another milestone, which embodies the revised and amplified Draft Inventory of Heritage Resources for all the portions of the Stellenbosch Municipality other than those already approved by Heritage Western Cape (HWC): the Historic Core of Stellenbosch and the Stellenbosch University Campus. The purpose of this report is to assist the Municipality to become compliant with the requirements of the National Heritage Resources Act (NHRA) as soon as possible, as it currently and in the coming months seeks to define (or amend) appropriate urban settlement, development planning and infrastructure instruments, spatial development frameworks and the like, for the future. The report has been submitted to HWC, as required by the NHRA. shapefiles assembled in the project Geographic Information System (GIS) database. heritage resources that need to be protected and enhanced. Click on the image below to open the Online Heritage Inventory Map. Click on this link to open the Expanded map which includes various Critical Biodiversity layers. Every link on the right-hand legend can be switched on and off. linked to them. Once clicked, it will take you to the pdf with further heritage significance information. the most thorough understanding of the Unit.